For NetApp storage systems that work in the cDot operating mode and have a SnapRestore license installed, Veeam Backup & Replication can use the NetApp SnapRestore technology for Backup from Storage Snapshots. Veeam Backup & Replication creates a snapshot of a volume holding VM data. 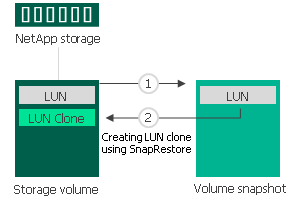 Veeam Backup & Replication creates a LUN clone via SnapRestore.